In this post we will review the FlightAware ADS-B Antenna and their 1090 MHz band pass filter. The FlightAware ADS-B antenna is claimed to have 5.5 dBi of gain, a rugged weatherproof radome and N-type female connector. It costs $44.95 USD on Amazon for US customers and $54.95 USD on eBay for international customers (plus shipping). They write that they are selling this antenna at cost in order to improve FlightAware coverage. The FlightAware ADS-B filter is a bandpass filter with a pass range of 980MHz – 1150MHz, ~1.5dB insertion loss and more than 40dB attenuation of unwanted frequencies. It costs $19.95 USD on Amazon for US customers and $24.99 USD on eBay for international customers (plus shipping). Generally it is much cheaper than other ADS-B filter options on the market. FlightAware.com is a company that specializes in aggregating ADS-B data from contributors around the world. People can contribute by using the FlightAware official hardware, or with a simple SDR, like an RTL-SDR dongle. They display the data on their website as it can be used to help track flight arrival times. A similar company is flightradar24.com. If you are interested in getting started with ADS-B reception with your RTL-SDR then we have a tutorial here. 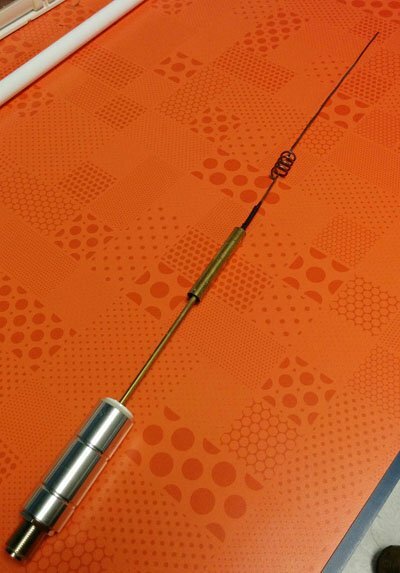 The FlightAware antenna is about 64cm in length and about 2cm in diameter. It uses an N female connector and comes included with mounting brackets and U-bolts. It is painted olive green. In the photo below we compare the size of the antenna against a reference monopole antenna, an RTL-SDR dongle and the FlightAware ADS-B filter. The antenna appears to be very solidly built and of a high quality finish. The antenna is wareproofed with some silicon caulking used around the seams of the endcaps. The FlightAware ADS-B antenna is a collinear type antenna. Collinear antennas are omnidirectional (receives equally from all directions) and have a higher gain compared to most other omnidirectional antennas, but their radiation pattern is flattened and directed more towards the horizon. This is a good thing for receiving planes that are far away as they will be at lower elevations, but aircraft at higher elevations relative to your antenna may be received poorer. Although, it is likely that any aircraft at high elevations to your position will be closer to you anyway, and thus have a stronger signal making the reduced gain at higher elevations less important. Judging by it’s ~60cm length and it’s specified gain of 5.5dBi, the FlightAware antenna is likely to be a 4 element collinear. A 4 element collinear generally has positive gain from 0 – 20 degrees of elevation, whereas a simple dipole or ground plane may have positive gain from between 0 – 40 degrees of elevation. A typical commercial jet flys at about 10km. At a distance of 100km this jet would be at a 5.7 degree elevation, and at 10km 45 degrees. Smaller aircraft fly at about 3km maximum, and at 100km would have an elevation of 1.7 degrees, and at 10km 16.7 degrees, so the collinear covers most cases. A reader wrote in to us to let us know that the internals of the FlightAware antenna had actually previously been posted in an old thread on their forums. From the image it looks like the antenna may be a sleeved dipole + whip + impedance matching design, or something similar. This design is somewhat of a collinear design thanks to the additional whip which also gives a flatter radiation pattern with more gain direction out towards the horizon. These antennas are omnidirectional (they receive equally from all directions) and have a higher gain compared to most other omnidirectional antennas, but their radiation pattern is flattened and directed more towards the horizon. This is a good thing for receiving planes that are far away as they will be at lower elevations, but aircraft at higher elevations relative to your antenna may be received poorer. Although, it is likely that any aircraft at high elevations to your position will be closer to you anyway, and thus have a stronger signal making the reduced gain at higher elevations less important. The internals of the FlightAware antenna. If you live in a valley, or have multiple obstacles such as trees or buildings blocking your view of the horizon then the higher gain design may work worse than a dipole/quarter wave ground plane/folded monopole type antenna. In this situation you’d mainly only be able to receive ADS-B signals from higher elevations, so an antenna with a less flat radiation pattern would work better. See the end of this post for some example radiation pattern diagrams. In this review we test the FlightAware ADS-B antenna against a reference antenna which is the folded monopole antenna by Adam 9A4QV. We’ve previously reviewed Adam’s antenna here, and we think it is a good low cost (~22 USD), small sized and ESD safe antenna. The folded monopole antenna theoretically has a gain towards the horizon of 3dBi, whereas the FlightAware antenna has a theoretical gain of 5.5dBi towards the horizon. The folded monopole should be similar somewhat similar in performance to a quarter wave ground plane antenna. The test involved running both antennas next to each other with two different RTL-SDR dongles. The antennas were mounted in a second story window which faced a busy flight corridor and airport. Results were recorded using modesdeco2 for a few hours. Each antenna was connected directly to the RTL-SDR with as little coax cable as possible. From the results the FlightAware performed significantly better than the monopole. The maximum range reached with the FlightAware antenna was 232 nmi (430km, 257 miles), whereas the folded monopole reached 190 nmi (351km, 218 miles). The FlightAware antenna also received about 40% more position messages. The maximum possible physical range of ADS-B signals is about 400-600km, so the range acheived is pretty good. Notice how in the Contacts/Distance graphs that the FA antenna had a huge spike at a distance of 7 nmi, whereas the folded monopole has a dip. 7 nmi was the distance of a nearby international airport. So the FA antenna was able to receive ADS-B messages from aircraft on the ground (0 degrees elevation), whereas the folded monopole was not able to receive ADS-B messages from aircraft so low due to its lower gain out towards the horizon. This helps confirm the theory that the FA antenna receives better out towards the horizon. Here we used a Vector Network Analyzer (VNA) to measure the SWR of each antenna. A lower SWR means that the antenna is better impedance matched to the receiver, and so less of the received signal will be reflected and wasted. In the SWR test both antennas had excellent SWR at around 1090 MHz, with both Adam’s antenna and the FlightAware antenna being about 1.15. The FlightAware antenna however has pretty poor SWR of ~10 at 978 MHz, so it may not be so good for UAT reception at 978 MHz. Adam’s antenna has a much better SWR of 2.0 at 978 MHz. The FlightAware filter is also very solidly built measuring in at 8cm long with a body diameter of about 1.9cm. The strong metal casing also adds a very surprising amount of weight to the filter. The metal casing acts as an RF shield and the casing has one SMA female and one SMA male connector. The filter can be connected any way around. A filter will only help if you are experiencing interference from nearby signals at 1090 MHz in your area. If there is no interference a filter may actually worsen reception because there are insertion losses. However, if there is interference a filter will significantly improve reception. Here we measured the filter characteristics with a VNA, and compare it against the filter by 9A4QV. The FlightAware filter has a much sharper cutoff, significantly blocking off frequencies below 980 MHz. 9A4QV’s filter on the other hand has a much more gradual cutoff. The insertion losses at 1090 MHz for both filters were very similar at around 1 to 1.5 dB. Here we tested the filter in an area with strong DVB-T transmissions at around 500 MHz. These strong transmissions were causing overload in the RTL-SDR causing very poor performance at 1090 MHz. Problems also similarly occurred when an LNA was used. From the screenshots we can see that the 1090 MHz ADS-B signals are not visible as the band is completely wiped out by overload from the DVB-T signal without the filter. We could reduce the gain to a lower value to avoid overload, but then the ADS-B signals become very weak. After adding in the filter the ADS-B signals can now clearly be seen on the waterfall. For the LNA test the filter was connected before the LNA. The filter significantly improved reception in this location with the strong transmitter, but in another location with no strong interferers reception was very slightly worsened. To see if you need a filter we suggest setting up your antenna and looking at the ADS-B signals in SDR# whilst setting the gain to maximum. If you cannot see ADS-B signals when the gain is maximized, but you can see them when the gain is significantly reduced, then you may benefit from filtering. It seems that FlightAware have done a very good job with this ADS-B antenna and filter. The price of both products is certainly much lower than other similar offerings such as filters from Minicircuits. If you are only using the stock antenna or a poorly built home made antenna and you want to improve your ADS-B reception these high quality yet low cost products are highly recommended, but if you are on a true budget, then you can build a collinear antenna yourself out of coax cable, though be aware that getting it constructed right can be difficult without an antenna analyser. Compared to the folded monopole, the FlightAware antenna is significantly better at our location. Though we note that the monopole may have better performance when used in a valley, or with several trees/buildings blocking the horizon. The monopole design also has some unique features such as it’s DC grounded static proof design. The FlightAware filter is also a very nice product, with a nice sharp bandpass cutoff, sturdy metal shielded enclosure and low price. It will help ADS-B reception in areas with strong interfering signals, but does not need to be used if there are no interferers. Both these products go nicely with our SMA based RTL-SDR dongles available at our store. Disclaimer: We purchased all the items mentioned in this review with our own funds. Below we show some example simulated radiation patterns for a dipole, 4, 6 and 8 element collinear antenna. From the graphs we can see that an aircraft at an elevation of about 45 degrees would have a -15dBi gain on a 4-element collinear and a -1dBi gain on a dipole. However, for an aircraft at an elevation of 2 degrees, the dipole has a gain of 2dBi vs 5dBi on the 4-element collinear. Simulations performed on 4nec2. An easy method to find the presence and strength of RF signals at your location, interfering with 1090 Mhz signal. Thank you for the forum and information. Your work is appreciated. I would like to ask about this comment. Could that be reworded for clarity? “Nearby” in my mind at first told me “close to my location”. I think what you might mean is near 1090 mhz, but not ADS-B transmissions. Another question that pops into my mind is about the notation that the filter might actually hurt. Of course there is some insertion loss, hopefully less than 2dB. But in general I thought it was good to reduce the total power on the front end of the receiver as a whole. My guess is that Flightaware figured as much as well when they came out with the “plus” pro stick that includes the filter built in. Nearby actually refers to both, near the 1090 MHz frequency and near to you physically. For example mobile phone signals at ~900 MHz are sometimes an issue, and often there is a nearby tower meaning strong signals. That said, the interference doesn’t actually have to be nearby in both senses to cause issues. e.g. you can also get very strong FM interference from a tower several kilometers which can also cause overloading issues. If you don’t need a filter, then adding a filter in front of an LNA will indeed hurt by adding insertion loss. If it’s added behind the LNA, like in the FlightAware dongles any filter insertion loss will be negated. But then you still have the problem that the LNA could be overloaded by interfering signals. Link to Flaightaware post dated Sept 2015 was broken. Here is correct link for the post which has download link for simulation file “CoCo 8 element FPE insulated.nec” which was uploaded to one-drive by abcd567. Very interested the all kind of ads-b receiving, i make several type of antenna, and my question : how create the polarogram ? In this article base of modesdeco, unfortunately try 4 different computer, and not running, read all article, unfortunately not kick to work (under XP and 7). Fortunately, RTL1090 ads-b receiver is stable running of all these computers. How to generate a coverage map or polarogram with use of RTL1090 software ? and a ‘blog T2’, feeding a PI B.
Hi, would love to know what VNA you guys use. We’re using the miniVNA Tiny http://miniradiosolutions.com/. We’ll probably review that too one day, but it’s an excellent low cost unit as long as you don’t need anything super accurate.